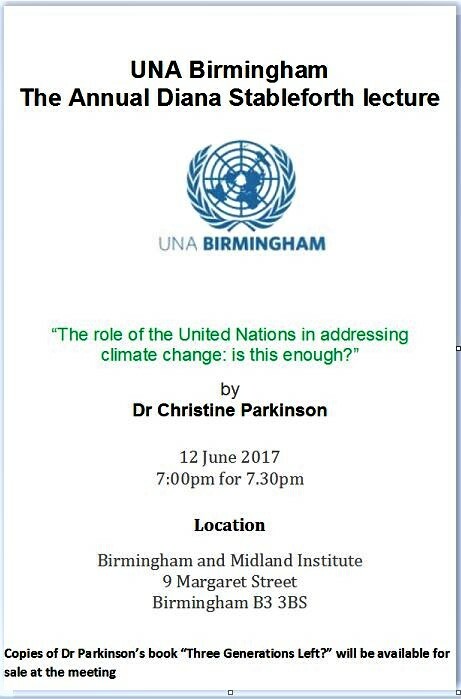 Local author Christine Parkinson, who will be speaking about the United Nations’ role in addressing climate change, is a biologist who worked in medical research before coming to this city where she has co-founded regeneration projects, the most well-known being the Jericho Employment Project based in Balsall Heath. Her latest book: “Three Generations Left? 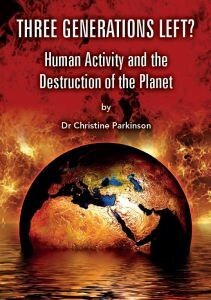 Human Activity and the Destruction of the Planet”, outlines how so-called progress has combined with a host of other factors, including free trade, a market economy, population increase and the development of a super-rich minority owning most of the wealth of the planet, to bring about global warming and climate change which could lead to a loss of many species and mass human extinction before the end of this century. Her target audience is aged 15-18 and any adult new to the subject. It is quite constructive, despite its title and her positive recommendations for change were recently posted on an economic and political website and the West Midlands New Economics Blog. “However sceptical the reader may be, a close consideration of the evidence set out by Dr Parkinson must surely cause such a reader to reconsider his or her opinion”. “Three generations Left” can be ordered direct from the publishers, using this link. Any profits from the sale of this book will be used to fund the work of Dr Parkinson’s son Ben, amongst slum children in Uganda. Last year was a difficult one for this project (Chrysalis Youth Empowerment Network), due to the devaluation of the pound post-Brexit. In the council chamber, Cllr John Clancy’s passionate address about the ‘Unemployment Iceberg’ earlier this month, was warmly applauded and can be seen on video here. He said that long-term unemployment is soaring – up 49% during the last 12 months – due to the economic crisis caused by the financial sector, not ordinary people. No one is spending and we need to change course before we hit the iceberg. Years ago, Sir Adrian Cadbury set up the Aston Commission which published several findings; one was that people in the area were unable to get bank loans to start or improve businesses because they had no form of security to offer. To address this, he worked with Localisation West Midlands’ co-founder Pat Conaty, then working at the Birmingham Settlement, to set up a revolving ‘not for personal profit’ fund – the Aston Reinvestment Trust [ART] . When loans are repaid the money helps another business and profit is reinvested in the company. Over the years it has created or retained more than 4000 jobs in the city. Dr Christine Parkinson studied as a biologist and spent the first part of her career in medical research before changing direction and moving to Birmingham, where she has helped to develop three socially beneficial projects in the inner city. One was the Jericho Community Project, which continues to offer paid work experience with training, to the long-term unemployed, through community businesses. And with help from the Government’s Regional Growth Fund . . .
News of other enterprises directly or indirectly addressing the demoralising unemployment ‘iceberg’ will be welcomed and featured here.